This refreshing body wash, which doubles as bath bubbles, mixes mouth-watering kaffir limes, sparkling lemons, sweet vanilla musk, and coconut oil for an energizing and revitalizing wake up call for tired minds and bodies. It is formulated with Coolcapsule™X to cool and refresh, radiance-boosting kiwi water juice, and a super creamy moisture-boosting base. 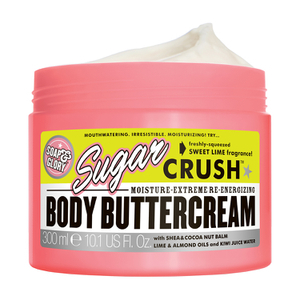 Scented with Sugar Crush™- Sweet Lime & Vanilla Musk fragrance. Lather all over body and rub in well, then rinse. Combine to make this bath soap a cheery morning experience. It glides right over your skin and feels super.